I’ve been pretty good about my eating. I was trying for 700 bike miles for the month. I’m fairly happy with my recent weight loss. Today was Car-Free Happy Hour at Clifton Pizza. I was unsure I even wanted to go, but I did go. I’m glad I did. Tom was there with his wife. They had ridden a tandem recumbent. I ate two pieces of pizza and had some beer. 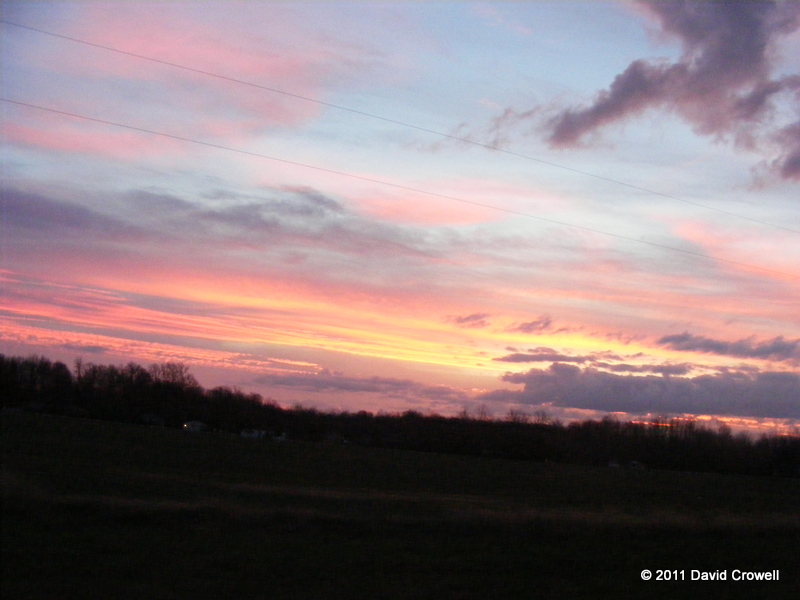 I followed Tom to his house in Lyndon, then headed home. I wasn’t sure exactly how many miles I needed to get 700 for the month. I came up short. I got a total of 697.7 miles for November. It’ll do. It’s still a new personal record. I’m going to ease up a bit in December. I need a break. I mentioned last week that I wanted to break my old record of 671 miles in a month. I want to completely break it and get 700 miles this month. I only needed 53 miles to do it, and I had the day off work today, so I planned a 55-mile ride for today. 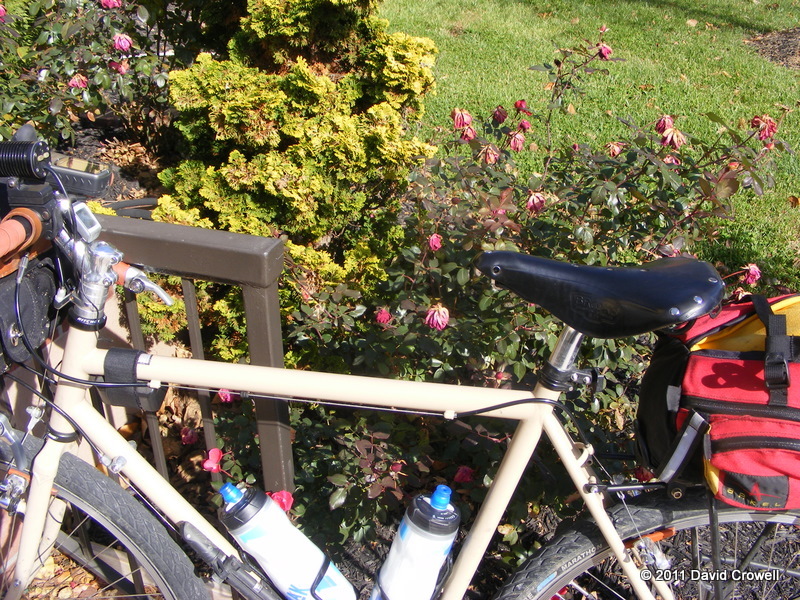 I hadn’t ridden the recumbent in a while, so that was to be my bike of choice. The recumbent had a flat tire that I didn’t get around to fixing last night. I pulled the wheel off this morning and found the valve stem was damaged. I grabbed the spare tube and found that it had gotten punctured in storage. I patched the spare and got the tire mounted and aired up. With the wheel back on the bike, I gave it a spin. The wheel was quite out of true. I assumed I just needed to tighten a spoke or two. This was frustrating, but within my ability. After closer inspection I found a broken spoke. Okay, not riding the recumbent today. I decided the single-speed would be a better choice anyway with the generator lighting. It’s dreary and rainy outside. It took very little to get the bike ready to go. The hard part about dressing for the weather is that it’s in the 40s and raining. The easy part is that the temperature isn’t supposed to change much all day. A mixture of wool and synthetics was called for. I dressed a little light so that I wouldn’t overheat. I wore my rain cape to prevent my upper body from getting soaked. I was out the door and heading west down Hill St. I made my way to the west end and turned north toward Shawnee Park. That’s when I noticed the wind was from the north. The rain cape became a sail. After riding through Shawnee Park and Portland I was eastbound toward downtown. I felt better here until I got in between tall buildings that were funneling the wind in odd directions. 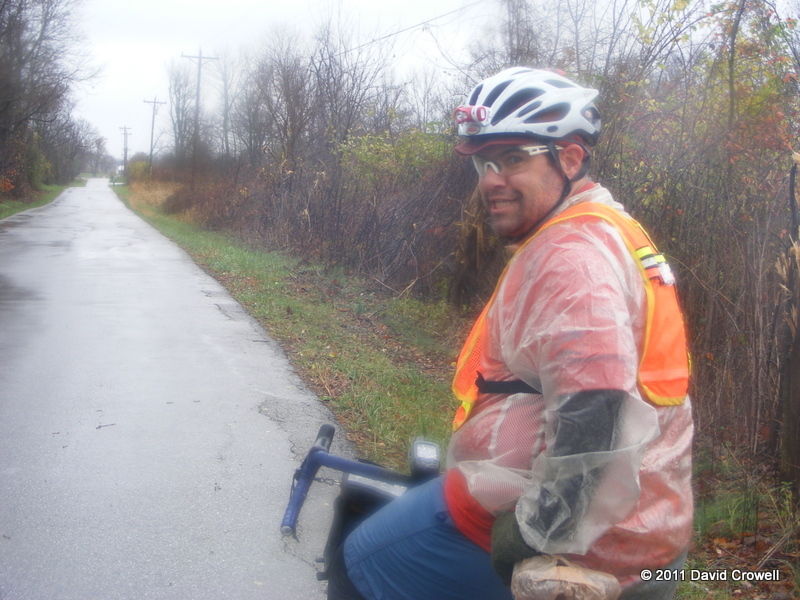 Again, the rain cape was a liability, but with heavy rain, wind, and no jacket I wasn’t going to take it off. I stopped at my workplace to say hello, use the restroom, and warm up. I then went across the street for coffee. I continued east on River Rd. I knew at this point I wasn’t going to finish the planned ride. I was too cold. I turned on Frankfort Ave and came across some flooding. I carefully rode through watching the depth. I didn’t want to get my feet wet or submerge my dynohub. I succeeded in not submerging the hub. My feet got soaked. Even with wool socks my feet got very cold. I continued out Frankfort Ave to Bike Couriers Bike Shop. I stopped in and look around. They had a Radish in stock. Neat! I also noticed they had a decent selection of useful fenders and other utility cycling stuff in stock. After that I headed nearly directly home. I was cold and wet. I also needed to use a restroom again. My mileage for the month is 667.3. That’s less than four miles short of a new personal best and not far from 700. I still have two more days to hit the 700. I should be able to do that by taking the long way to work or back. 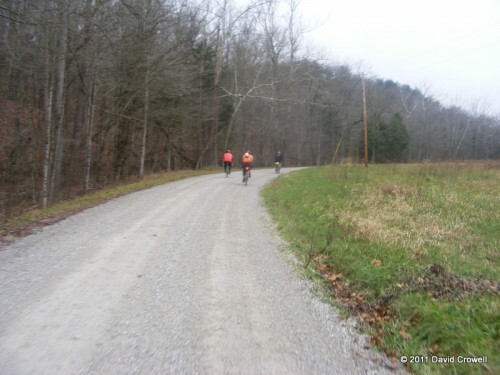 Four of us got together for the RCCS Gravel Wander/Training out of New Washington today. It was partially just because we enjoy gravel and partially to train and judge our ability for the Gravel Grovel that is only six days away. The weather started out in the mid-50s, a tad warmer than expected with heavy overcast skies. It had rained overnight and the roads were wet. Patrick was riding his new Salsa Fargo, Timothy his new Origin8 29er, Tim was riding his Cross Check, and I was riding my LHT. 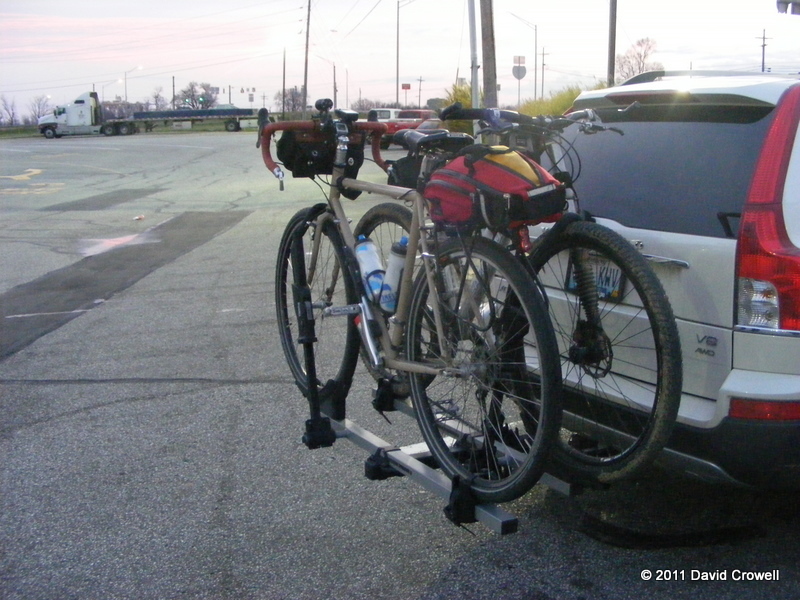 So, two disc-brake mountain bikes, and two “road” bikes with cantilever brakes. 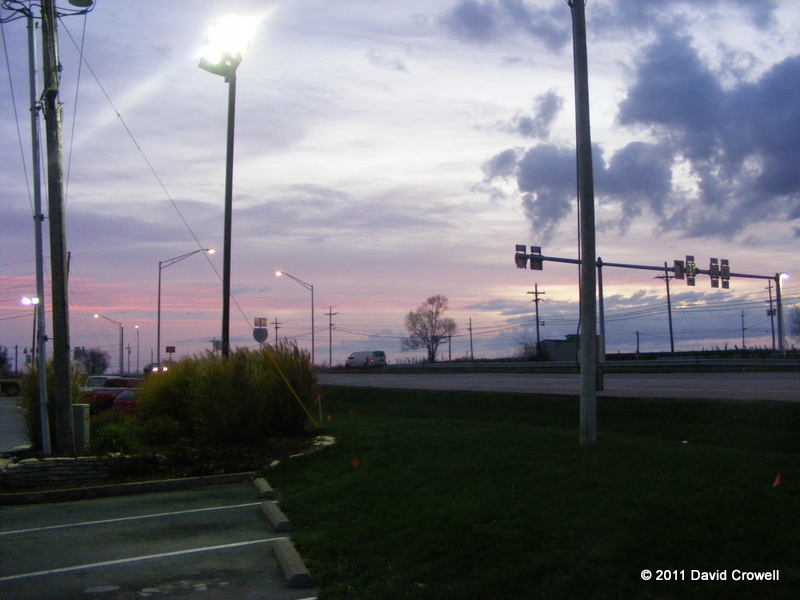 We headed northwest out of New Washington on lightly traveled roads. It was quite nice. We did stop to adjust clothing early in the ride as we had overdressed. 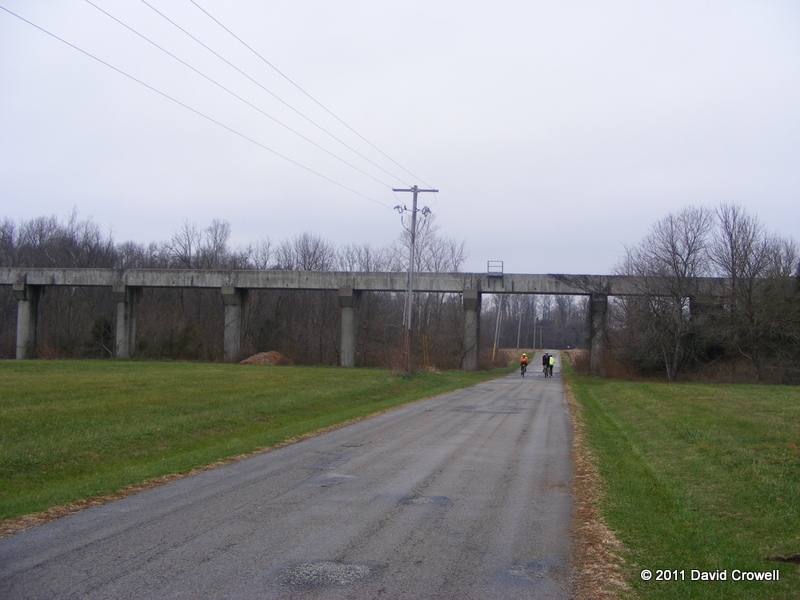 On Concord Rd was this interesting concrete railroad bridge. There are no longer tracks on it. 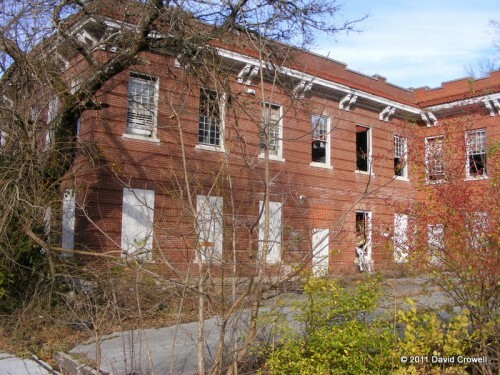 It was built as part of the Marble Hill Nuclear Plant project to bring construction material in by rail. Shortly after the bridge, we turned on Arbuckle Rd, a nice stretch of gravel. I wasn’t feeling strong and my speed dropped in the gravel. 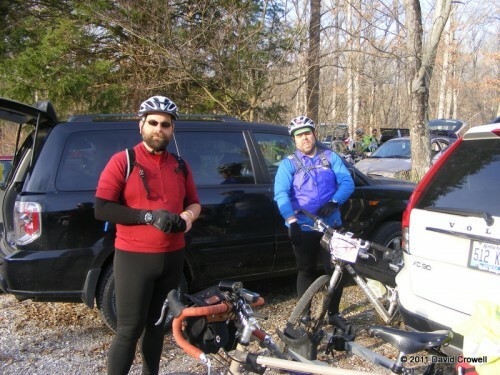 After a while, Timothy and I were riding together while Patrick and Tim were further ahead. As we neared a left turn on the route, Tim and Patrick continued straight. We yelled for them, but they couldn’t hear us. We waited a bit but they disappeared from sight. The “left turn” took us through a gate on to two-track and I thought this was the “mud pit” road I had ridden with Tim in August of last year. Timothy and I rode down the two-track, figuring we’d meet up with the other two later. We passed a parked Jeep and continued. The two-track opened up into a cornfield. The corn had been harvested leaving 3-inch stalk sticking out of the ground. We made our way in the general direction of the “road” according to the GPS, but it was veering out of the field into thick underbrush. We eventually decided that this was not the “mud pit” road and turned around and went back. While exiting back on to the road, a hunter with a large rifle approached us and asked what we were doing. He was worried we were messing with his Jeep. He was actually friendly once he figured out we were not messing with anything. 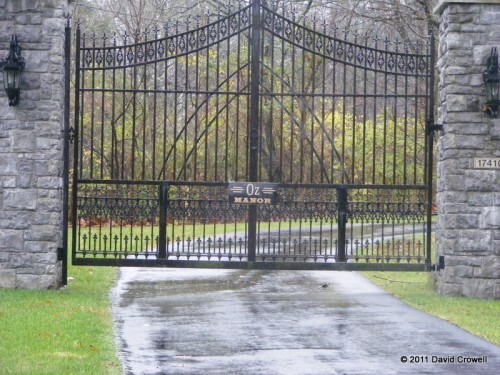 I talked to Patrick on the phone, and he said they’d meet us at Hutch Rd. We detoured around the “not road” marked by Google and my GPS as S 900 W.
We made our way to W 500 S and the GPS track for Hutch Rd had us turning left… into a driveway. Tim and Patrick were not there. I checked my phone, and there was a text saying they would meet us at the north end of Hutch Rd. 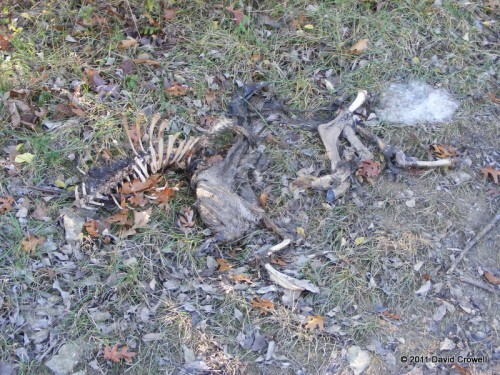 Timothy did not seem eager to ride on private property after the encounter with the hunter. 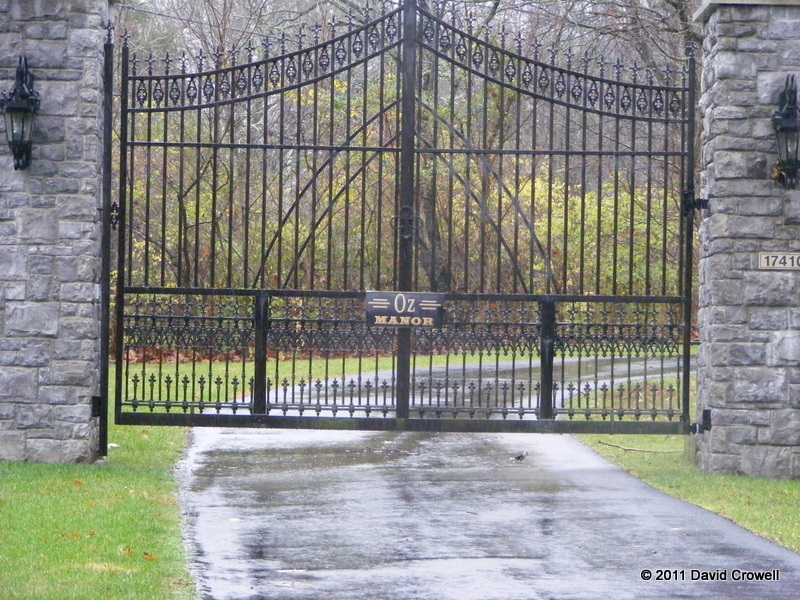 We detoured around Hutch Rd, but did not see Tim or Patrick where Hutch Rd intersected with S 850 W either. We continued on for several miles. Eventually I noticed Tim and Patrick behind us. They apparently had been chasing us for some distance after seeing my tail light from a distance. 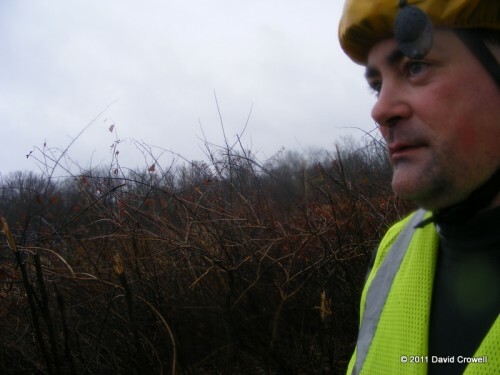 I also found out from Tim that Hutch Rd was the “mud pit” road from last year. We missed out on that. We meandered north toward roads Timothy had found while planning the route for the Charlestown Populaire. 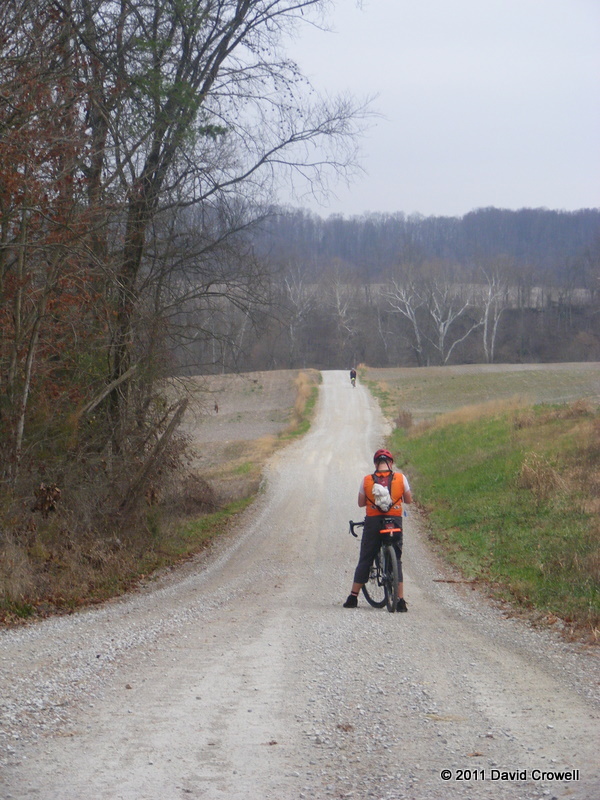 Once getting north of Deputy Pike, these were some of the best gravel roads of the day. I was forcing myself to eat and drink at this point. I wasn’t hungry or thirsty, but I knew I’d bonk if I didn’t get things down. I still felt okay though. It was shortly after this picture was taken, at about mile 28 or 29 that the rain started. It was a light misting rain. It persisted for the rest of the ride and made balancing temperature more difficult. This area was near a small branch of the Muscatatuck River. We’ve ridden near/over this river many times, just not near here. We meanders southeast for a while, eventually coming to the town of Hanover, our lunch stop. We hadn’t researched where to eat, but Hanover has a few places. Between the GPS devices and smartphones we had, we quickly found Jendy’s Pizza that was only a quarter mile away from where we pulled over to discuss options. We continued to Jendy’s and walked in quite soggy. I had a small pizza, a 12″, I think. Comments were made about my ability to eat large amounts on a ride. Yes, I’m a pro, don’t try this at home. The bad part about a lunch break on a cold, wet ride is that you get colder. Getting back on the bike was hard. I really wanted someplace warm to curl up and sleep. We left Hanover descending a steep downhill toward the river. It was raining a bit harder now. Tim and I, with out cantilever breaks, were riding the brakes down the hill to keep them dry enough to function. Timothy and Patrick were enjoying their disc brakes. All of us were freezing. A fast downhill without a chance to warm up first made things quite uncomfortable. We were heading for River Bottom Rd. 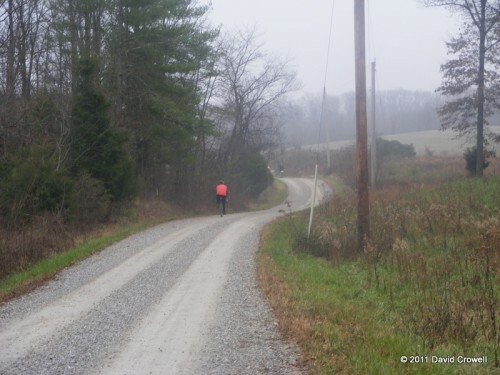 The northern part of the road near Hanover is gravel, yet I’ve never ridden that section. Eventually a sign marked “Road Closed – Travel at your own risk” and the pavement ended. That was different! This gravel was large chunky stuff. It was tough going. Hit a rock wrong and the bars would try to twist out of your grip. There were also large black rocks stacked off the side of the road that looked like coal. I didn’t stop to inspect it, I wanted to keep moving to stay warm. As we were now down in the river valley, the river was to our left, and hills to our right. 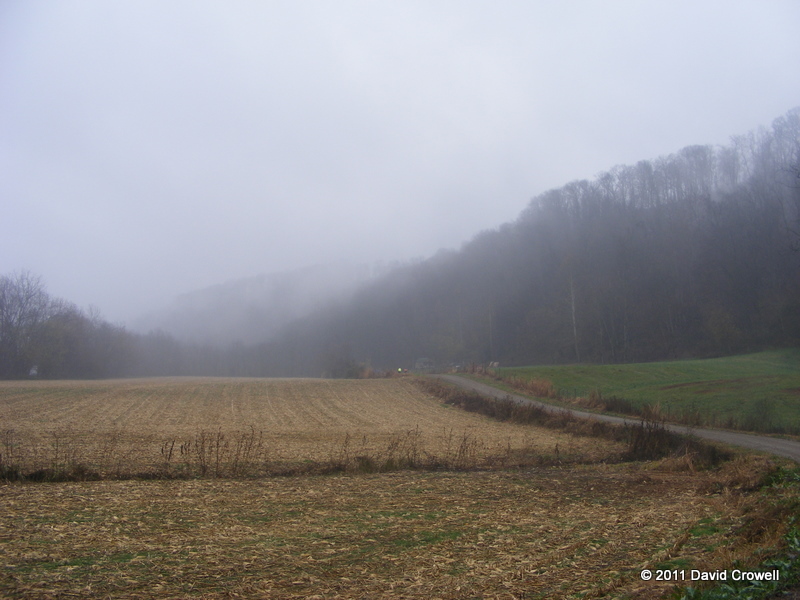 Low clouds were rolling in just over our heads, obscuring some of the hills. It was surreal, like something out of a movie. 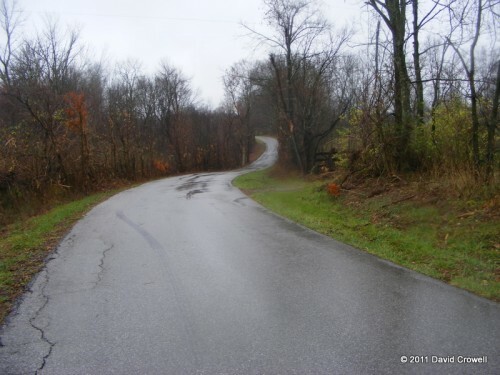 Eventually the pavement began again and before long we were on a steep climb on a smoothly paved road – W Prospect Rd. I was glad for my low gears as I slowly spun up the climb. We were all very tired by this point. There was still much gravel. I can’t remember which roads were gravel, and which weren’t but we still had plenty of gravel. There was one small loop off of paved road that I had originally planned to ride, as it was extra gravel on those three roads. We all decided to skip it and moved on. There was still more gravel. Somewhere around Taflinger Rd the gravel ended and we were on the home stretch. 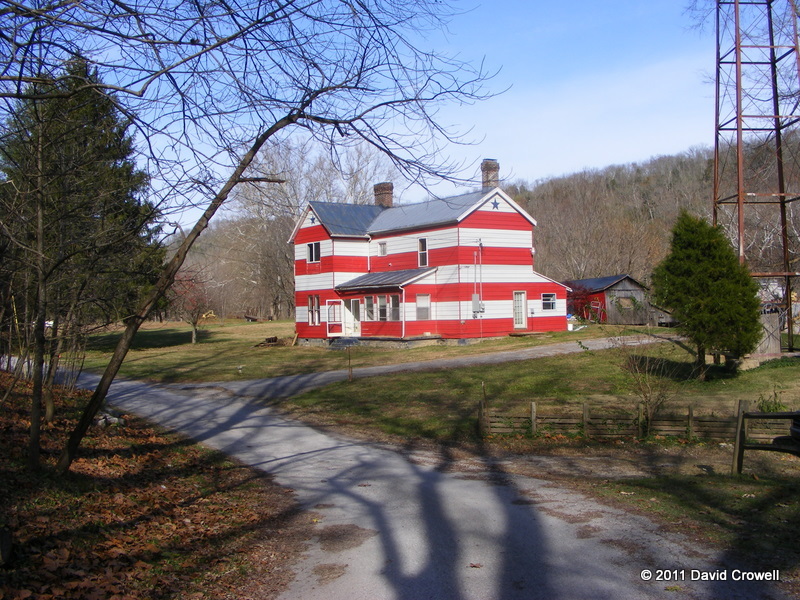 We rolled New Washington – Bethlehem Rd into town and back to the cars. Tim drove me home, but we stopped for coffee on the way. Once I was home I hopped in the bathtub full of hot water. I was chilled to the bone, and that seemed the best remedy. I stayed in the tub for a while reading, until the water started to cool. Next Saturday is the Gravel Grovel, and I’m about as ready as I’m going to be for it. I’m fairly certain, barring calamity, that we can make the eight-hour cutoff. I’m optimistic that we can finish in six and half hours, allowing us to see the awards ceremony. I’m also fairly certain that my mileage for the month will be quite nice! I met a guy a few months ago at the car-free happy hour who was assisting TARC with getting the necessary data to Google to allow public transportation as a mapping option for Louisville. I saw on various websites that Google has pushed this out for the public. This is much easier to use than there previous trip planner they had online. I didn’t ride my bike to work today. I was too sore from yesterday’s century. I considered taking the bus, but the rainy weather this morning would have meant a crowded bus, and I wasn’t in the mood for that. I called a cab. It’s only the second time I’ve been in a cab, and the first time taking one to work. I got a ride home from a co-worker who pretty much insisted that he take me home. I was planning on taking the bus. So, I congratulate Google, TARC, and the guy who’s name I can’t remember. This will be handy getting to other destinations on days I just don’t feel like riding my bike. The smell of latex inner tubes. Yesterday’s populaire left me exhausted. I went to bed early and had plans of getting up early to ride around town with Tim. I slept through the alarm. Once I did wake up I noticed a text message from Tim. He had gone on without me. Good, I’m glad he didn’t wait. He watched Dale race at the cyclocross event. 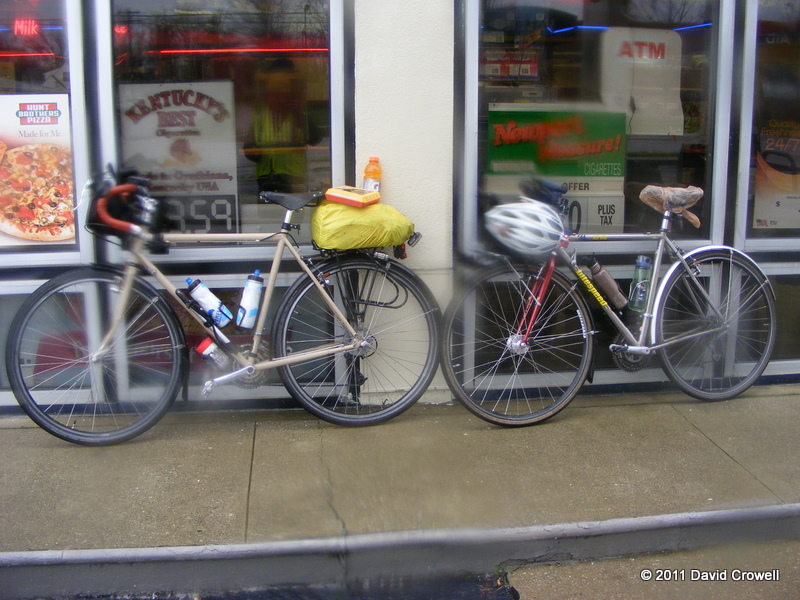 I eventually got enough coffee into me to ride down to Sunergos to drink more coffee and meet up with Tim. After finish my “breakfast of champions” (scone and brownie), we headed out through UofL and south down through Beechmont and South Third St.
We were fighting quite the headwind in this direction. The wind was stronger today than what I suffered through yesterday. 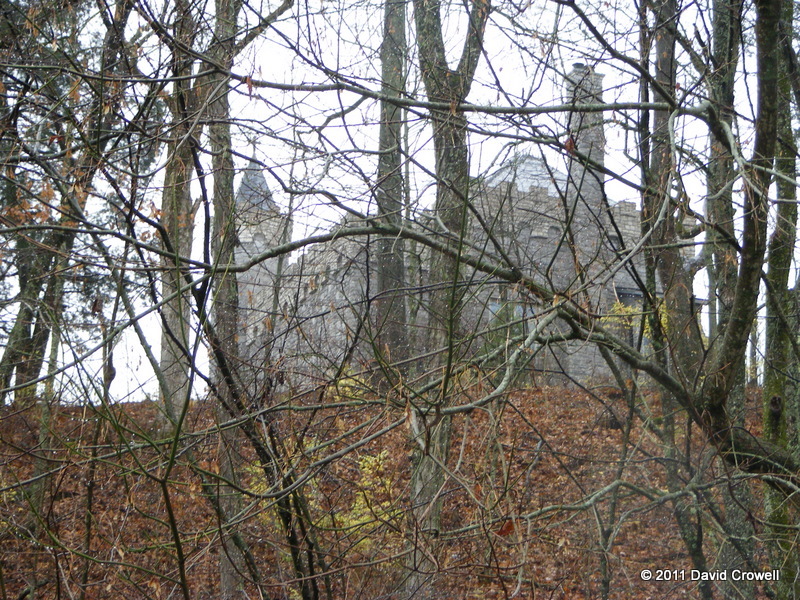 We turned on Kenwood Dr to go to Iroquois Park, but Tim decided to check out Kenwood Hill Rd. We quickly turned around and started our climb. It seems an interesting part of town, and home of the Little Loomhouse. Kenwood Hill Rd loops around and dumps you back on Kenwood Dr. Then we headed to Iroquois Park again. The day was warming up and there were quite a few walkers and joggers. The leaves were crunching underneath the tires. It was quite a peaceful ride, climbing the hill at a relaxed pace. I stopped at a scenic overlook for pictures. We continued to the top and rode through a walking path cut through the tall grass. We left Iroquois Park and headed northeast on Southern Parkway. Tailwind! We cruised along at 17-21 mph with very little effort. It was nice. This lasted (only slowing or stopping for lights) all the way through UofL and eventually turned southeast on Bradley Ave.
Our route took us through Joe Creason Park and eventually Dundee Rd. We split up there. Tim headed for home, I turned north and went to breadworks for more carbs and coffee. I took the direct route home giving me 27.5 miles for the day (27.9 according to the GPS). I think Tim had about 10 miles more than me, due to his riding while I slept. I rode my first LBC populaire in July. There were several of us RCCS guys on the ride. I was quite slow, riding the ‘bent, and still recovering from my neck issues, yet I still had people riding with me. As I recall, there was also a good turnout for that ride. I also barely made the time limit due to stopping too long for lunch in Lagrange. I rode another one in September. My neck was healed about as much as it ever will. Timothy advertised it as fixie-friendly, perhaps for a stronger rider, and I rode my single-speed. I walked a few hills, but I enjoyed the ride. I also rode alone most of the time. Yesterday was the November populaire. It was billed as a “distillery tour”. It left from Buffalo Trace in Frankfort. Strangely that was the one distillery that I didn’t get to visit. I managed to get a ride from Timothy to the ride start. 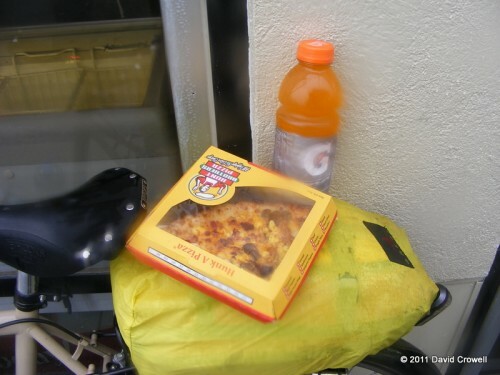 I was well stocked on food as I had no intention of stopping to eat during the ride. I was riding the LHT with trunk bag for clothing and handlebar bag for everything else. There were a total of five of us gathered for the ride. The other four were much stronger riders than I. We headed out on Wilkinson Blvd and made our way to Bridge St, where an metal-grate bridge goes over the Kentucky River. My fat tires on the LHT mean that I couldn’t really even feel a difference in the road surface, but the fact I could look down and see the water below was a bit weird. At this point, Timothy and David King had pulled out into the lead. I was in the middle and the two other riders back behind a bit. I had hoped to stay near other riders as I’m not good at reading cue sheets and GPS data was not provided for the ride. I did have my GPS tracking my route though. Eventually we turned left on Devil’s Hollow, our first real climb. It’s a little over a mile long and varies between 6% and 10%. It was a workout, but I never felt the need to drop into the granny gear. I am slow on climbs though, and it was in this stretch that the other two riders passed me. I was now riding alone, less than four miles into the ride, and would remain riding alone for the remainder. I was looking for my left turn at Pebblebrook Way followed by another on Pea Ridge. 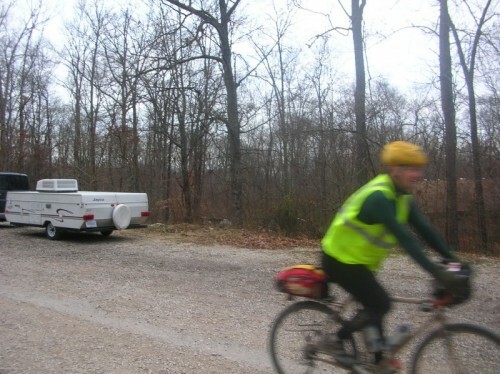 I was riding along and noticed that I sailed right past Pea Ridge. I turned around and went down Pea Ridge, assuming that Devil’s Hollow had turned into Pebblebrook Way. It wasn’t until reviewing my GPS track and maps today that I realized I missed the turn. My error didn’t save any mileage, so hopefully RUSA won’t care. 🙂 Actually, they probably would care if I were trying to get Brevets in to qualify for PBP, but I’m not. Anyway, at this point I was unsure I was going the right way. I’m lousy with cuesheets and I was beginning to wonder if this whole thing was a bad idea. Maybe I should have stayed in bed. 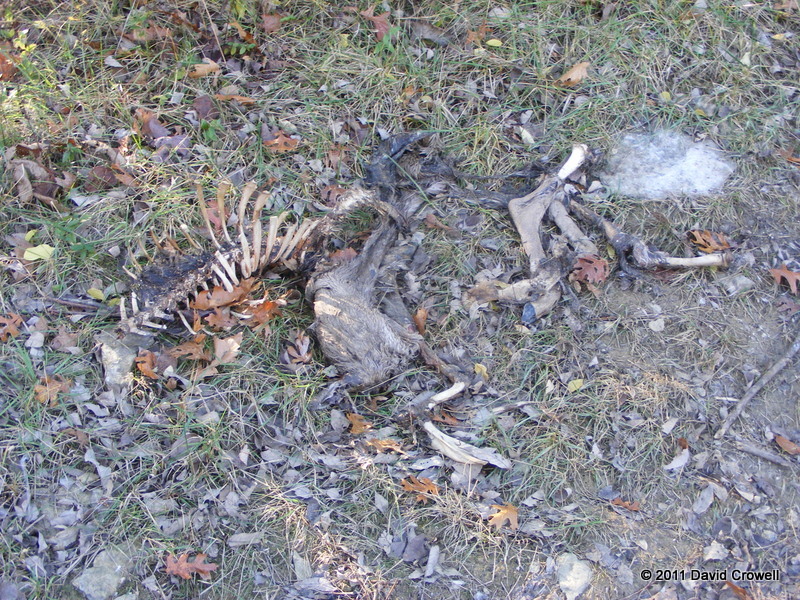 Adding to the morose attitude were these remains on the side of Pea Ridge Rd. I was frustrated with riding alone on a group ride. I was frustrated about not knowing where I was at. The cue sheet seemed a thin thread to keep me going. I was frustrated with the headwind I’d been fighting my whole time on Pea Ridge Rd. 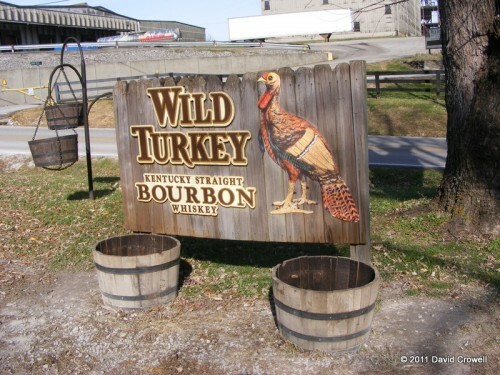 I came to KY-1665 and headed south. This gave me confidence that I was indeed headed the right direction. It also took me directly into the wind. It was at this point I remembered I had to eat on the bike. I grabbed a pop-tart out of the handlebar bag and started chewing it while sucking wind. Not a good combination. I almost choked. A few swigs of water later I was better. I followed KY-1665 along until S Benson veered away, then I followed that. This brought me to KY-151. I didn’t recognize it at the time, but I’ve driven KY-151 many times. It was part of the route I would drive to Harrodsburg when Kristy lived there. 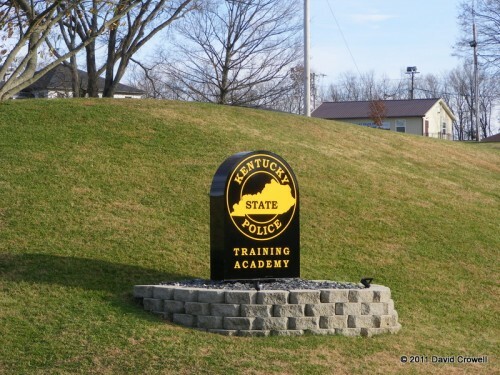 If the route would have taken KY-151 all the way to the 127 bypass, I would have realized where I was, but the route made a quick jog west on KY-512 then south on Puckett Rd. Puckett Rd was narrow and scenic, but the first half mile had a number of houses and a bit of traffic. Once I got beyond that area, traffic thinned out. I stopped to eat and drink (about three minutes) so I didn’t choke on my food, and continued on. This eventually led to Hammonds Creek Rd, which is busier than the maps would lead you to believe. I was passed by several large diesels blowing fumes at me. My mood at this point in the ride was dark, but I was still determined to follow the cue sheet and had no further issues with it since the Pebblebrook Way thing at mile 3.8. I also knew that I’d eventually be going the other direction and this damn headwind would be a tailwind. A short jog on KY-44 and turn south on Powell Taylor Rd. The terrain around Powell Taylor was wide open. There was no shelter from the wind. There were often short stone walls that were falling apart. That’s part of Kentucky I enjoy, but something a little taller to block the wind would have been nice. The first half of Powell Taylor Rd was a slight climb, followed by a gentle descent. A group of cows in a field scattered as I rode by. I nearly choked on my snack again as I tried eating and riding. At least getting a drink of water was easier. There was a quick jog on US-62 before I turned southeast on Mill Creek Pike, or KY-513. It looked much like Powell Taylor Rd, but had a yellow line down the middle. It was fairly low-traffic. A quick turn on Bonds Mill Rd (still KY-513) brought me to the first control. At 30.9 miles was Four Roses distillery. It as a beautiful, if windy, day and there were plenty of tourists coming and going from the gift shop. I was in a hurry. I ran in and used the restroom, refilled my water bottles, and got my card stamped. There are rosebushes decorating the grounds around the building. 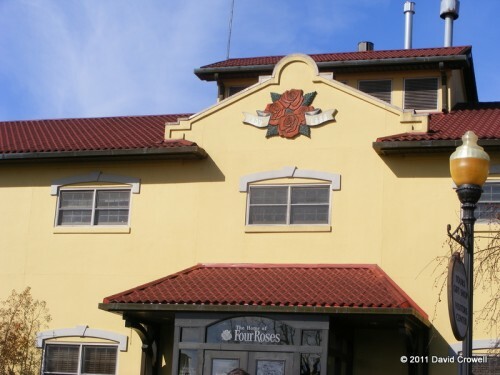 Quite fitting for “Four Roses”. I was surprised to see some semblance of roses on them in November. KY-513 continued eastward to US-127 (or is it the bypass, I don’t know). I had to make a left here, and did so without incident. I saw the “By-Pass Motors” sign that I’ve seen dozens of times on trips to Harrodsburg. 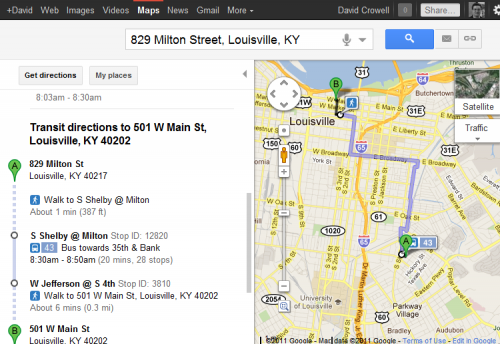 I knew I was south of Lawrenceburg (Larryville?) 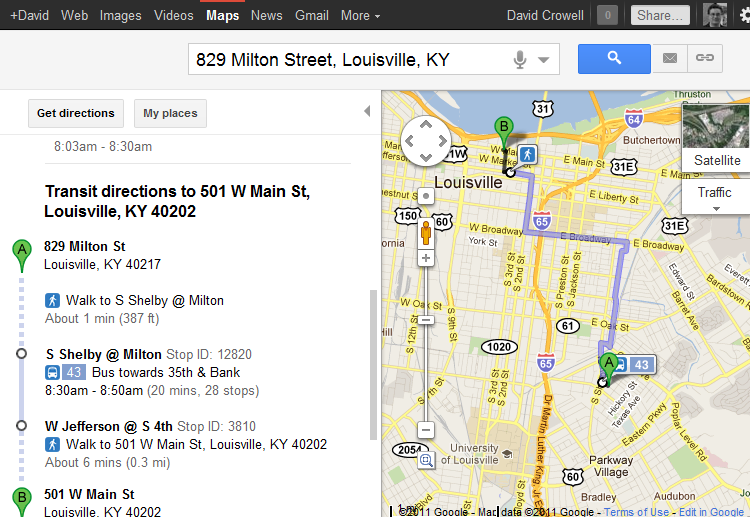 What I didn’t realize is that the route was taking me in a big loop around Lawrenceburg without ever going into town. I also didn’t realize that my right turn at Harrodsburg Rd was the old 127, so I went past it briefly before figuring it out, and doing a U-turn on the bypass. I headed north on Harrodsburg Rd. There was surprisingly little traffic considering it’s the former US-127. I guess the bypass is really working. I was approaching the town of Lawrenecburg, but I would turn east on Wildcat Rd before reaching town. Wildcat was pleasant. It was slightly rolling, but eventually began diving into the creek valley. At this point the pavement ended and the route followed the one section of gravel. 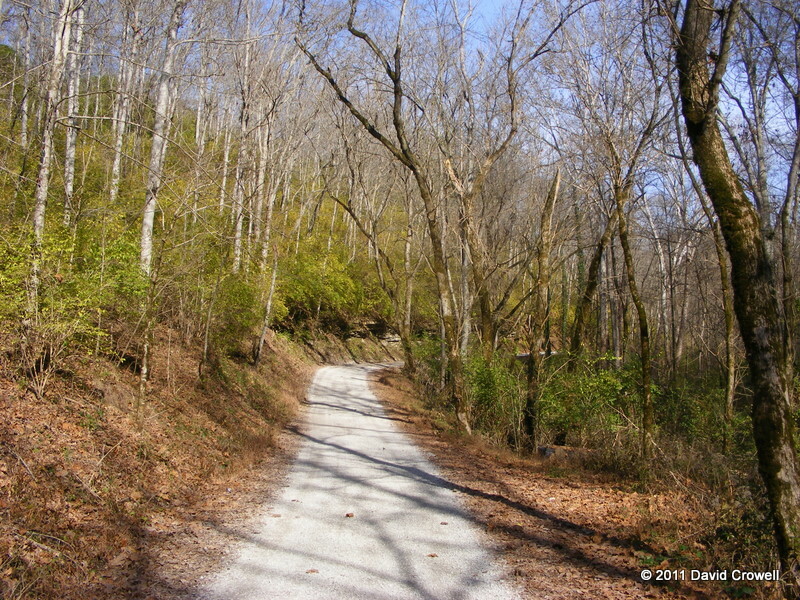 The beautiful scenery of Wildcat Rd was marred occasionally by junk dumped on the side of the road or even in the road. I had to ride around a mattress. Once reach the lowest elevation it’s going to, Wildcat bends sharply left, the pavement begins again, and a rather eye-catching house greets your entrance to Tyrone KY. Tyrone is a (former) town along the Kentucky River. I’m guessing it floods often enough to be unsustainable. There are more former houses there than occupied ones. Following Tyrone Rd along the river is pleasant until I come near the quarry. The gravel trucks rumble by often throwing gravel and diesel fumes. One passed close enough at full throttle that the jet of exhaust coming out the side warmed my leg briefly. 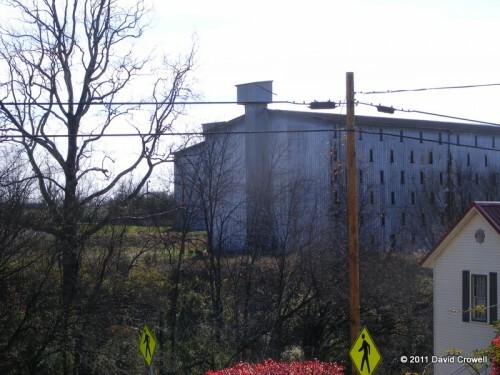 Then there was a nice climb up to the Wild Turkey Distillery. I was hoping to run in, get my card stamped, and leave quickly. Unfortunately, there was a good crowd in there and a long line at the counter. I was able to by-pass the line for a quick stamping of the card, then I was on my way. Visible from here was the US-62 bridge over the Kentucky River. It’s quite a distance over the water due to the terrain on the other side. Also visible is a railroad bridge that’s even taller and substantially older. I don’t know if it’s still used, as it looks pretty worn out. I’ve been told it’s called high-bridge. I did not get a picture. I continued on Tyrone Rd and turned right on US-62. From where I turned to the bridge was downhill. I managed to hit a good speed and took the lane. There was one car behind me, but he didn’t seem impatient. After the bridge is a sharp right then the road slopes upward. I was heading southeast again and had some wind in my face, so my speed suffered. Visibility on this stretch of road was bad. Even though I was now hanging to the right it wasn’t safe for cars to pass, and they weren’t passing. Once a good line of them had built up, I pulled off the road too let them pass. I took the few moments to eat and drink some more also. The route eventually turned off of US-62 to Milner Rd, then to Steel Rd, which I followed for quite a few miles. 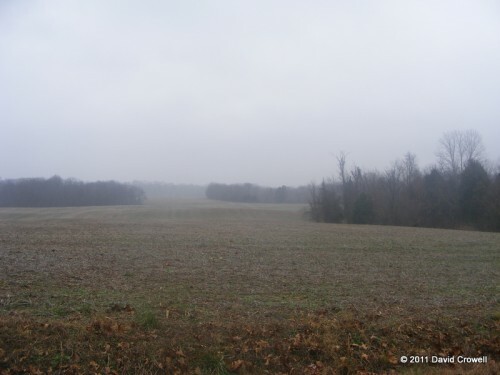 Steel Rd started out in typical “rough-rural” form. A few farms, some ramshackle homes. Eventually it looked more like what rural Kentucky is known for, horse farms and well-manicured estates. I think I prefer the ramshackle look. Also I was now heading north. I had a tailwind! My mood had improved dramatically. I hadn’t been lost in many miles and I knew I’d easily make the cutoff time. The cue sheet had an upcoming left turn for New Cut/McCracken. There was a right turn for KY-1659/McCracken Pike shortly after that. I came to a stop sign and the cross road was McCracken Pike. It was still to early to the first turn. I zoomed out on the GPS and saw that New Cut would loop around and meet up with McCracken Pike. Timothy had added this little bit to get the mileage right. So, I continued straight and later turned left on New Cut. 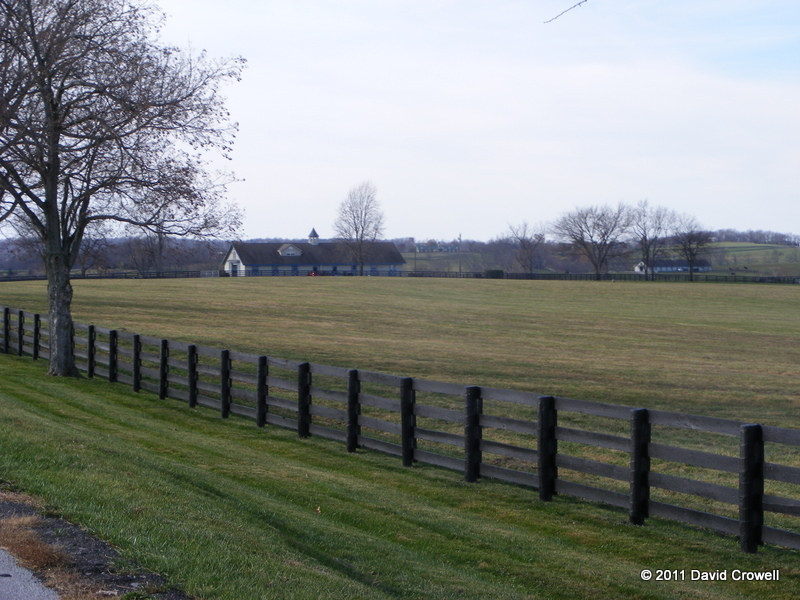 New Cut was typical horse farm country. I met back up with McCracken Pike and it was a short ride to the Woodford Reserve distillery. I’m not a bourbon connoisseur. They all taste the same to me. 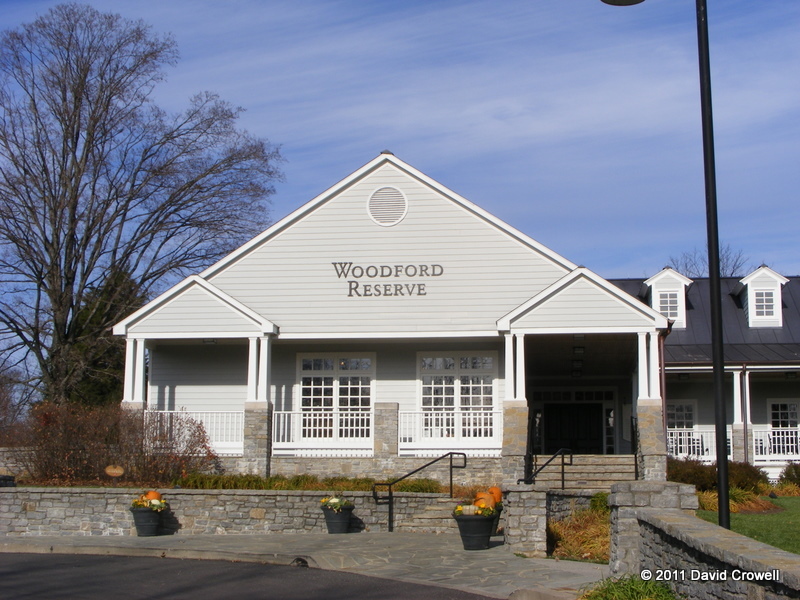 I’ve never had Woodford, and I didn’t have any yesterday. I’ve heard that it’s overpriced. I will say this. Their setup for giftshop and tours is better than the others. 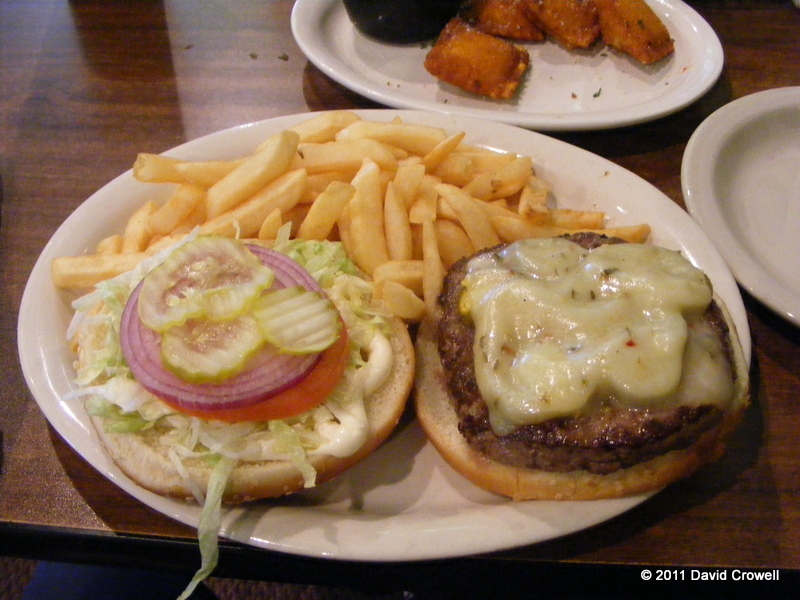 It’s larger, well-staffed, and I was greeted and had freebies pushed at me as soon as I walked in the door. I really just wanted my card stamped. They stamped my card and ate a free bourbon ball and was given a shot glass. I may have to buy a bottle of Woodford just for the service I got as a non-customer. 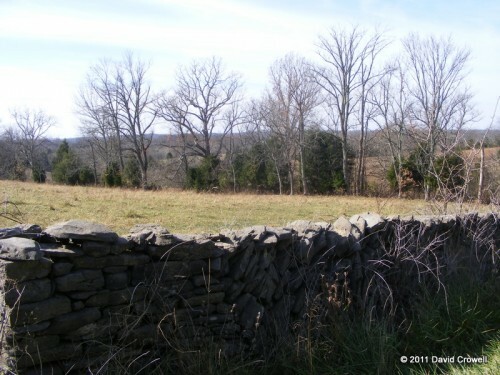 I continued north on McCracken Pike. It runs parallel to Glenns Creek for a while. I went through the tiny town of Millville, which has no other streets. It’s just McCracken Pike with the creek on one side, and a clump of houses on the other. 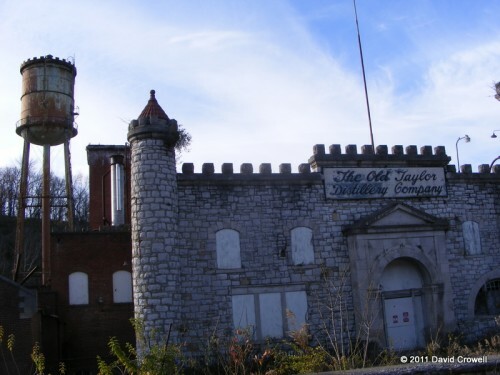 I eventually pass the now-defunct “The Old Taylor Distillery Company”. It looked vaguely familiar. It took me a bit to remember where I saw it, but I believe this road was on the route of the 2009 Ride to Conquer Cancer. McCracken Pike eventually is know as Glenns Creek Rd then Martin Luther King Dr. I ignored the name changes and enjoyed the view. Where Glenns Creek joins the Kentucky River the road follows the river instead. It then goes underneath the two impossibly-tall I-64 bridges that seem to cross the whole valley. As the route enters the Franfort area again, I turn left on Coffee Tree Rd. I saw no coffee. I could have used a cup. I did see the State Police Training Academy. I was on a bit of a hill and had a nice view of the Capitol Building. A zoom lens made this shot possible. I didn’t take any more time with pictures. Coffee Tree Rd pretty much does a 180 where it crosses KY-676 and becomes Glenns Creek Rd, but with no connection to the previous Glenns Creek Rd. One more climb then a left turn at US-60/Main St with a nice downhill run into town. 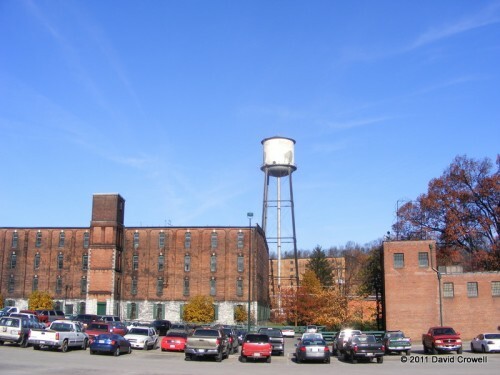 From there it was a stroll down Wilkinson Blvd and back to Buffalo Trace. Buffalo Trace was now closed, but Timothy was waiting at the end to mark my card. I finished the ride in 5:55, my best 100K ride yet. What is the indecision? I’m not sure if I want to do more populaires, or worse yet a brevet. My riding style is more relaxed, slower, and with stops for food and pictures. On the other hand an occasional populaire/brevet is good for making me faster without resorting to dedicated training. I also like group rides to, you know, ride as a group. I spent nearly all of the ride alone. I don’t mind solo rides, but those start solo, and won’t have anyone waiting for me at the end. I don’t know. I’m still undecided about the future of doing these rides. The early part of the ride I really wanted to give up the populaire and head for Louisville. I would have sent Timothy a text message to let him know I wasn’t going to need a ride home. I then could have ridden any pace I wanted, guilt-free. Later in the ride I was completely enjoying myself. I didn’t take as many pictures as I normally do during a ride, but that means few to post here (which is a bit of a pain). So, I remain undecided, yet overall pleased with the ride yesterday. I woke up feeling ill still. It’s mostly head congestion and a sore throat. I enjoyed an extra-long shower to clear everything out and took a leisurely ride to work to relax. I had gotten up early enough to not hurry, and even had oatmeal for breakfast. Work was busy, a bit hectic maybe, but went by quickly. I felt much better as the day went by. I met up with Tim after work for a training ride. It was dark but we were both well-lit and reflective. The weather was comfortable. I felt strong and had a spirited ride. I won’t lie, Tim was ahead most of the ride and probably riding stronger, at least until the last two miles. I pulled ahead and left him quite a way back. He worked hard to pass me again and I was too tired to chase. I then took a long-ish route home meeting Bethany, another bicycle commuter on Third St. We chatted briefly before going our separate ways. After arriving home, I was tempted to go out for dinner, not because I’m hungry, just having a craving. The spirited ride actually suppressed my appetite, so I’m skipping dinner and staying home. I’ll eat a hearty breakfast in the morning. It also feels good to make the right dietary decision. I need to do that more often. I couldn’t sleep due to phlegm. I got hungry so I cooked some white rice. Still being good, and going to try to sleep again. Posted on November 7, 2011 November 7, 2011 Categories Bikes, Food6 Comments on Great Day! 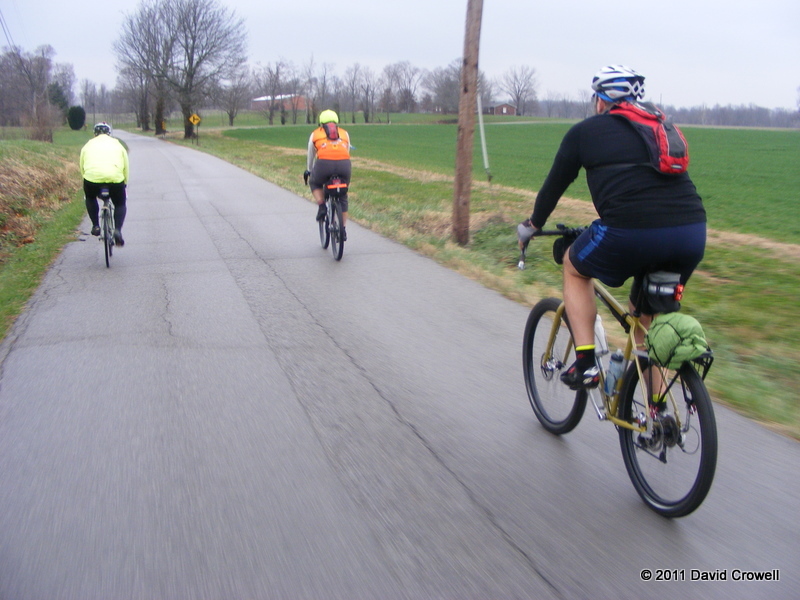 I rode about 42 miles this morning with Tim and Patrick as part of our Gravel Grovel training. It was a road ride, but the idea is general fitness. I’ve lost a lot of fitness. I really struggled to keep up. I had an “auspicious” start by oversleeping. I got a text message from Patrick as I was heading out the door asking if I was gonna be there or not. Oops. 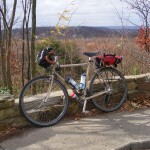 I was riding the LHT in “gravel grinder” mode. It’s stripped down with fat tires (700×47), but I did put the rear rack back on. I need the trunk bag for clothing storage in changing temperatures. Once I arrived at Breadworks, I had to have coffee. Without coffee, I don’t exist. That took some more time. It’s hard to guzzle hot coffee. I seemed to (mostly) keep up with them on the flats, but as soon as there was climbing, I fell behind. I actually lost track of them at one point in the Mockingbird Valley area. They had made a right turn, I went straight. We eventually met back up and headed up River Rd to Prospect. Shortly after, Patrick headed for home. Tim and I went for more coffee, then back into town for a bike shop stop. I bought a couple of spare tubes. I followed Tim home and picked up a saddle for the Big Dummy. I stopped for a beer on the way home. I had a bunch of housework to do, so that’s what I spent the next few hours doing. 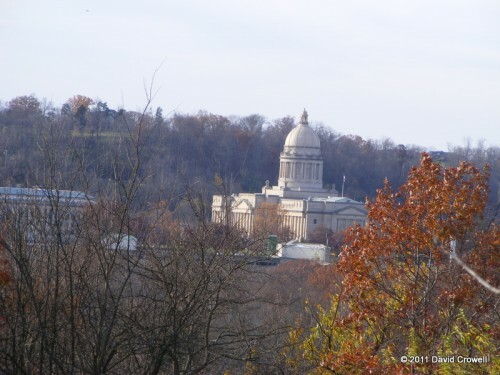 I later had to run an errand out off of Frankfort Ave. I took a long-ish scenic route out. On the way back, I was sure to ride the Beargrass Creek Trail, something I rarely do on solo rides. I was on the Big Dummy with the newly installed saddle. I think the stem I put on it a week or so ago is too short now. I should have adjusted the (old) saddle before buying a new stem. Oh well, live and learn. I then headed to Cumberland Brews for dinner and beer. Another 14 miles for the day. It was a pretty good day overall. I sold my truck today. I was expecting to be extremely happy, as I’ve been working toward this for a while. In reality, I was a bit sad to see it go, and I’m a little worried about the future. I first got a car when I was 16. It was a $250 beater – a 1974 AMC Hornet. I went through a lot of cars. Cheap cars and hard use meant I was always buying another car. I’ve (mostly) owned a car for a quarter century. How much did that cost? 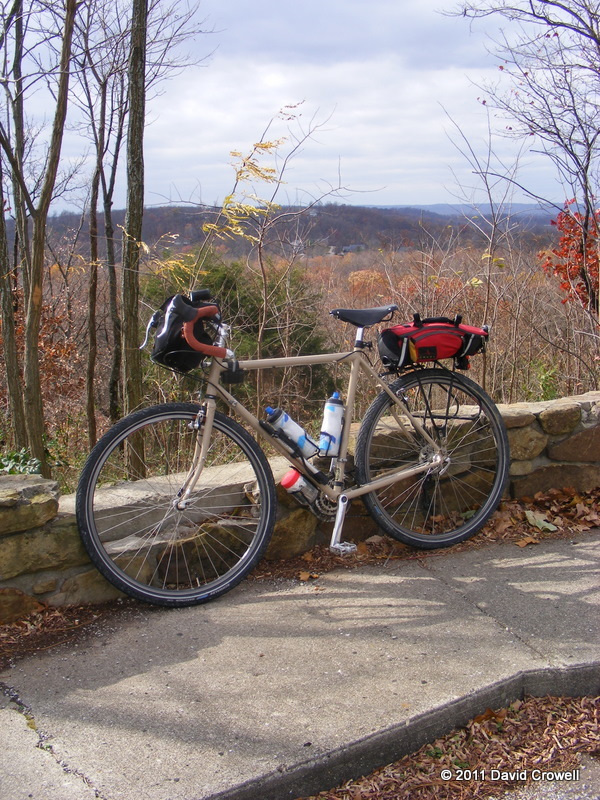 In the late 1990s I went without a car for a few weeks. I walked about a mile to get to work. I was offered a job 25 miles away, and bought another cheap car. In April 2009 I went without a car for a couple of weeks when my old Kia finally died. That’s when I bought the truck. Living in Charlestown wasn’t really conducive to living without a car. Now that I live in town and rarely drive, it was time. 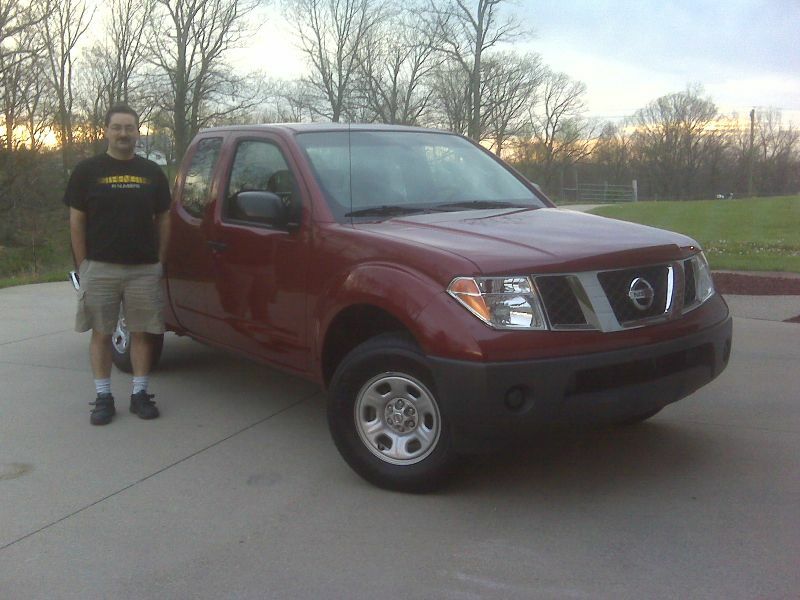 My “trial” started right after leaving Carmax, where I sold the truck. 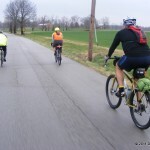 I had to ride on Hurstbourne Parkway for a short distance before heading west (north?) on Taylorsville Rd. These are busy roads and it was dark. I was riding the single-speed and have dyno-lights, plus a blinky. I was also wearing a reflective vest. I had surprisingly few issues. I stopped at Za’s Pizza on the way home to celebrate. Pizza is a much tastier fuel than gasoline. I intend to be car-free for the rest of my life. That may change, but it’s unlikely. I’m not anti-car. 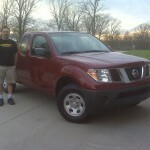 I’ll still rent one on occasion, once or twice a year, to travel to Michigan and visit family.